UMASH personnel were well represented at the November 19-20, 2013 Midwest Regional Agricultural Safety and Health Conference (MRASH) – “The Many Faces of Agriculture” held in Ames, Iowa. Amy Liebman, MPA, MA, UMASH Project Co-Director, presented on Seguridad en Las Lecherias; Matt Keifer, MD, MPH, UMASH Co-Director and Project Director, presented Farm MAPPER; Iris Reyes, MPH, exhibited both UMASH and National Farm Medicine Center programs and materials and assisted presenters and Dave McClure, PhD, MERC scientist attended the conference. 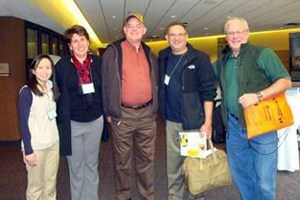 Fred Gerr, MD, with the Iowa Center for Agricultural Safety and Health ( I-CASH) hosted the MRASH Conference.